The 1176 really needs no introduction these days as it is one of the most well known compressors ever in audio production. It’s been around for decades featuring on countless hit records. It’s sound and style of compression, if pushed, is instantly recognisable. The 1176 is so popular that many have taken it upon themselves to build their own versions, either from sourcing parts or kits off the internet or companies, such as Wes Audio, taking inspiration from the 1176 producing a fresh take on the legend that is the 1176. In this studio test we put the Wes Audio Beta 76 through it’s paces. It looks like an 1176, all be it with a handful of neat additions… but does it sound like one? What makes this take on a legend different from the original units which came before? What Does Wes Audio Say About The Beta 76? The Beta 76 represents several significant structural improvements against the original version. Vintage mode: it’s a Carnhill input transformer. The result is a universal device with two different sound possibilities. A True Bypass switch was introduced as well as a high-pass filter in the Compressor’s Side Chain path featuring three cutoff frequencies (60, 90, 150 Hz) making the Beta76 less sensitive to low frequencies. As I stated at the start of the video, I’m not a big fan of referring to studio gear, such as the Wes Audio 76, as “copies” or “clones”. Somehow those descriptions don’t do justice to the efforts that were put into producing gear of this ilk. Instead, I feel the word “tribute” is a better way of labelling “recreations” of “insert popular studio gear of old here” as a tribute is only ever intended to provide an opportunity of getting close to the experience of whatever original “act” it’s imitating but at a fraction of the cost. There are several other brands which produce 1176 tributes, is the Wes Audio B76 the best tribute to date? I believe so. The price isn’t the cheapest compared to other variants from competing brands but the B76 does still represent great value for money over UA’s 1176, especially considering that the traditional control set has been added to with a side-chain, true bypass and input mode switch. As far as my ears can tell, the Beta 76 walks and talks just as an 1176 should. The true bypass button, which as far as I can tell, doesn’t features on other 1176 tributes, is a real blessing. Being about to click in and out the compression without reaching across the face of the unit to depress ratio buttons feels better and more intuitive. The side-chain is also a well implemented addition that I would have liked to experiment more with if I had two devices stereo linked together as I feel this extends the usefulness of the 1176 well beyond what we know an 1176 can achieve as the low end can be set to not influence the compression as much. This would have been great on full drum sub mixes with the side-cain set to 150Hz. The input mode selector is a neat addition, though the sonic differences between modern and vintage are, to my ear, very subtle… possibly too subtle to really make a decisive choices between if I’m honest, however, if your ears are more sensitive than mine to uber subtleties then I’m sure you would get a lot from this cool addition. For your £1,135 (Roughly $1,299) you will be getting a device that is absolutely true to the sound, performance and spirit of a “real” 1176 which retail for around £1,999/$1,999. Wes Audio have, without doubt, produced what I believe to be the best 1176 tribute to date. Sure it costs double what a Warm 76 tribute costs but don’t forget you’re getting extra bang for your buck in terms of control and features in the Beta 76. The only criticism I have of the Beta 76 is small but worth mentioning. The corner edges around the back of the device are razor sharp. I don’t know if this is the case (pun not intended) for all B76s or just the unit I had in for testing, but it was an area in the built quality that I felt was a bit of an after-though as these sharp edges felt like a slight oversight on a product that everywhere else feels premium and well built. 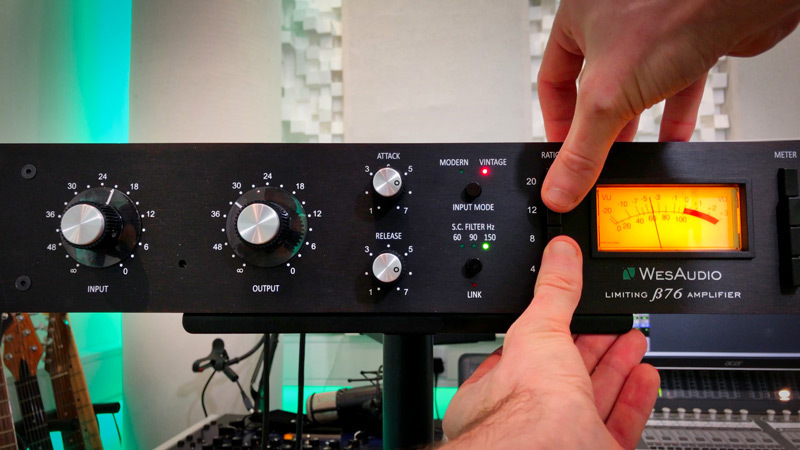 If you are interested in trying the Wes Audio Beta 76 then the team at SX Pro are more than happy to ship you a demo unit so that you can evaluate its performance in the comfort of your own studio and see if this device fits your requirements and workflow.